Our second month in Bali was spent out exploring a lot more and experiencing some of the nightlife! We had our friends from Canada, Garett and Alicia come and join us which made for some extra fun! 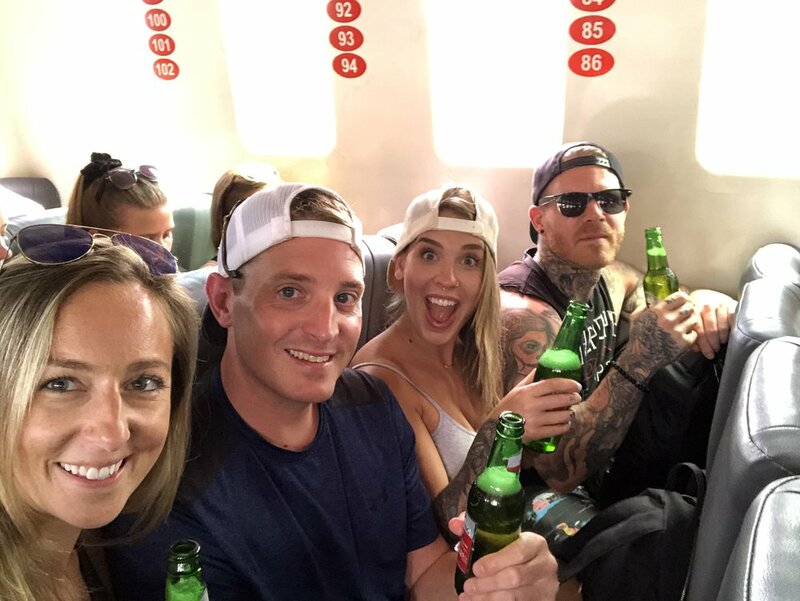 We spent a couple of afternoons and nights really enjoying happy hours and exploring the nightlife that Canggu had to offer. We spent a full day enjoying one of the nicer beach bars called “The Lawn”. We rented a cabana for the day and spent the afternoon sun tanning, taking dips in the pool, eating and drinking to our hearts content and finally enjoying the sunset. This is definitely a spot I’d recommend spending an afternoon at while in Canggu! Another great spot to go to, especially for Happy Hour, is Old Man’s. 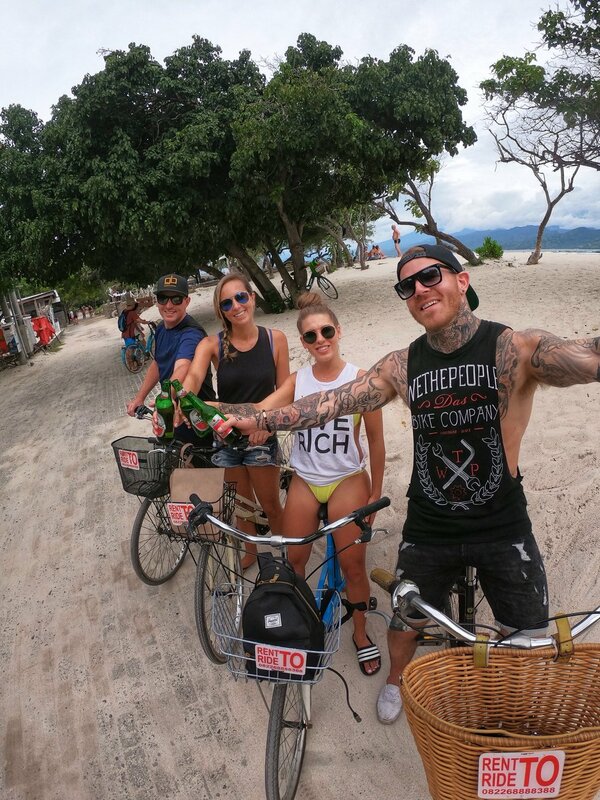 Located just off the beach they have an awesome 2 for 1 beer happy hour so as you can imagine we stocked our table full of the local Bintang beers and enjoyed ourselves! At night this bar definitely turns into one of the places to be with beer pong games, live music and late night eats. Once Old Man’s closes you can find yourself heading down to the beach and dancing the night away with your toes in the sand as a band plays down at SandBar! One late night we may have even all decided to get small tattoos “anchoring” us together and reminding us to always stay grounded and true to ourselves! We spent a couples’ weekend away on one of the nearby Gili Islands. We opted to go to the biggest island of the three which is still so small that you can really walk anywhere you want to go, otherwise you can rent bicycles and explore a little quicker. It really only takes a couple of hours to bike around the whole island. If you want to take a “taxi” you hire a horse and buggy to take you around- you may think I am kidding but I’m not! There are no cars and I think I maybe saw 1 old motorized scooter on the island- that’s it! Gili has some absolutely incredible blue turquoise water surrounding the area which made it a must do to hire a private boat to take us out snorkeling for the afternoon. We got to see some incredible underwater sculptures but the icing on the cake was being able to swim with the turtles. The 4 of us actually spent a good chunk of time swimming next to this one turtle as he peaceful swam around us. Every time we get to swim with a turtle it’s like a brand-new experience and definitely one of my most favourite things to do! With a chilled and laid-back atmosphere by day with beach loungers and ocean side cocktails once night time hits the clubs and bars really come alive. The nightlife on Gili T is most well known for a party all night kind of attitude. Besides the incredible snorkeling, Gili T is also most famous for its magical mushrooms. At almost every bar you can find pictures of neon glow in the dark mushrooms being advertised or people coming up to you to purchase a little banana leaf wrapped snack of mushrooms or else they will make it into a “shake” mixed with coke and pineapple juice to help make it go down easier. Every night you can walk down the main strip of party bars and definitely pick out whose dabbled in the local speciality and it’s pretty entertaining to see! While we were there we experienced an earthquake somewhere in the 5.2 range that came from the neighboring island of Lombock. Not sure if anyone remembers the earthquake last August that hit Lombock really hard and killed quite a few people. There were still quite a few people shooken up from this as lots of people actually live on Lombock and work on the island so they felt the after effects first hand. Luckily for us the earthquake was only a small one in the middle of the day and no damage occurred. One morning we decided to hire a car and driver to take us to visit a few waterfalls around Bali for the day. The driver took us to 2 totally different waterfalls. Tegenungan, our first stop, was beautiful with an almost overwhelmingly large waterfall but the thing we didn’t love about it was that it felt extra touristy to us. There was lots of people selling stuff at the entrance and they had extra attractions like “swings” and “bali nests” where people lined up to take photos in. Not saying we didn’t still line up to take some of those photos, but it just felt a little less natural to us. Our second waterfall stop, Tibumana, was much more peaceful with only a handful of other tourists visiting. The waterfall was really stunning and was in this deep waterhole and surrounded by gorgeous dense green foliage. It definitely made the experience a lot more personal and intimate as we got to go swimming beneath the waterfall, and we were able to capture some of those incredible moments on camera. We booked a private day tour to go explore Nusa Penida, an island relatively new to the tourist trail. We got picked up bright and early from our villa where we headed to the port for a quick 40-minute boat ride to Nusa. Upon arrival we were greeted by our driver and tour guide in their SUV which we were all so happy we had chosen to take a guided tour instead of renting scooters because the roads around this island were absolutely insane. Most of the roads to our destinations were small and narrow and drivers were pulling in their side mirrors as they met each other, not to mention the unsafe road conditions with all the potholes and bumps and uneven pavement and dirt. We saw a girl pretty shaken up after falling going down a hill on her scooter! Our first stop was Broken Beach and Angel Billabong which as you can see by the photos were absolutely stunning. We were up top but just the views into the water below and the different stunning water colours amongst the cliffsides was truly beautiful. The sun was out and we were definitely getting a little toasty so we had to stop for a couple cold beers along the way. After lunch we made it to Kelingking Beach which was definitely a high light of the tour. Once again, the view points from above were just amazing- the beach down below is relatively untouched with this beautiful white shining sand and the water colour is that crazy turquoise blue that just makes you want to jump right in! We were running behind from lunch, so we never made it down to the beach, but we heard it was even better than it looked from above! The steps down are super steep and super sketchy, made mostly of jagged rocks and bamboo railings. The few people brave enough to go all the way down had quite the hike back up the hill! We were told that multiple people have had to boated back out because they can’t make the climb back up from the beach! All in all this was a great day trip with some incredible relatively untouched scenery and views in Bali! It was also nice to see on this island a lot less garbage and plastic tossed around! All in all our 2 months in Bali flew by so fast that we really can’t believe it’s time to head back to Canada for the summer. We truly enjoyed our time here and it definitely won’t be the last time we come to stay for an extended amount of time!